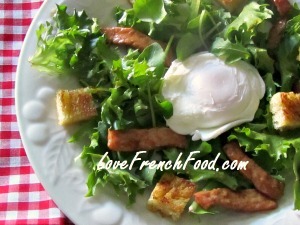 A Lyonnaise salad, or should I say, La Salade Lyonnaise is a very simple dish from the city of Lyon, and consists of fresh salad leaves, traditionally frisée lettuce, and pieces of lardons or bacon with a lightly poached egg resting on the top. Of course, the French housewife may add some fried bread croutons with it as well as she will not waste any bread and this is just one way she will use up any stale bread in her kitchen. It is dressed with an oil, vinegar and mustard dressing which is very easy to make yourself, so no need to go out and buy expensive bottles of French dressings. The salad is often served as a starter or hors d'oeuvre and is perfect for or a light lunch. I recently visited Lyon, and had the most enjoyable Salade Lyonnaise at a small buchon – Un, Deux, Trois – on place Neuve Saint-Jean in Vieux Lyon. It did indeed come with croutons, so clearly the chef had learned from his mother. · Chop the garlic and fry in a little oil in a frying pan until it flavours the oil. Remove from the pan. Or you can simply rub a cut garlic clove around the pan before you fry the bread. · Fry the bread cubes until crisp and golden. · Place the bacon in the pan and cook for about two minutes. · Add the vinegar and mustard and boil until it has reduced to about a third. · Pour this over the salad leaves and toss a little. · Boil some water in a pan (just enough to cover the eggs) to which you have added about a tablespoon of vinegar (don't overdo this, or the eggs will taste strongly of vinegar). · Crack each egg into a small bowl before sliding into the simmering water. · Poach for about 3 minutes until just set – the yolk should be still slightly runny. To serve, arrange the salad leaves with the bacon and mustard dressing on plates and place a poached egg on top of each. Sprinkle with the golden croutons and serve your Lyonnaise salad immediately.